Following a diet designed to increase brain health in the long term appears to reduce the odds of cognitive impairment and disorders including Alzheimer’s disease and dementia, a study led by researchers from the University of New South Wales (UNSW), Neuroscience Research Australia (NeuRA) and ANU shows. Published last week in Alzheimer’s & Dementia, the authors reviewed the potential protective effects of the Mediterranean-DASH Intervention for Neurodegenerative Delay diet, also known as the MIND diet. The Mediterranean diet is believed to have a protective effect in other health settings, such as cardiovascular diseases. The composition of the MIND diet is based partially on the Mediterranean diet but incorporates foods specifically relevant to brain health. 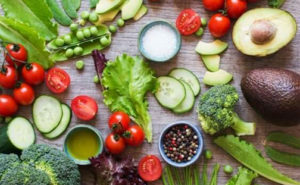 The MIND diet is characterised by 15 dietary components with a focus on green leafy vegetables, whole grains, olive oil and small amounts of red meat. The investigation followed 1220 adults aged 60 and older, for a period of 12 years. During this time, a dietary pattern that followed the MIND diet was linked to 19% reduced odds of developing clinically diagnosed mild cognitive impairment or dementia. In contrast, no benefit was found for adhering to the Mediterranean dietary pattern. Scientia Professor Kaarin Anstey, who led the study team, is Director of the UNSW Ageing Futures Institute. Her research group has a strong interest in identifying ways to reduce risk of dementia and improve healthy ageing. “This study has shown for the first time, outside of the United States, that the MIND diet reduces the risk of dementia,” says Professor Kaarin Anstey. Professor Anstey hopes the study will help researchers develop concrete recommendations for reducing the risk of dementia in Australia and around the world. The findings come from a 12-year longitudinal cohort study, the PATH Through Life project which is based in Canberra and Queanbeyan, NSW. Participants were interviewed about their dietary intake using the CSIRO food frequency questionnaire at the commencement of the study. Their cognitive abilities were monitored over time and they were also assessed for cognitive impairment. Their diets were scored to see whether the participants’ dietary patterns followed the MIND or Mediterranean pattern. Professor Martha Morris developed the MIND diet in the US. What sets it apart from other diets is the detailed specification of foods thought to be neuroprotective, such as green leafy vegetables and berries. The scoring also has a category for cakes and pastries, which were hallmarks of a westernised diet. This allowed researchers to better capture dietary pattern and behaviour of the participants. The authors say the next steps are to evaluate the diet in randomised controlled trials and to conduct studies that reveal the protective mechanisms and pathways associated with the MIND diet.